The Brit asked me to write this post because he thought it was a perfect example of why I should be writing a food and wine blog. It is not only because I cook and enjoy food and wine, but because when I am in restaurants I sit there and try to analyze how I would get that set of flavors in my home kitchen. Apparently, I stare at my food and taste it; locked in deep concentration. He tells me that you can see the wheels spinning in my head. I was a bit uncertain about posting a review of this dish. There are many reviews of it out there. It is one of their signature dishes. I had big expectations of it upon ordering, as I had heard and read so many positive things about this menu item. So let’s talk about the chicken. What you get is a half of a chicken, braised greens, and mashed potatoes. It’s a large plate. Here is something to know about me. I rarely order chicken in restaurants. They nearly always let me down. The chicken is always overcooked. I was pleased with my food in the first bites. I had the thigh and it was tasty. I started analyzing the unique coating. I would describe it as crispy, crunchy, and not greasy. There were layers of flavor to the coating. It wasn’t that the entire show was a bunch of spices in the buttermilk mix; this is what intrigued me. 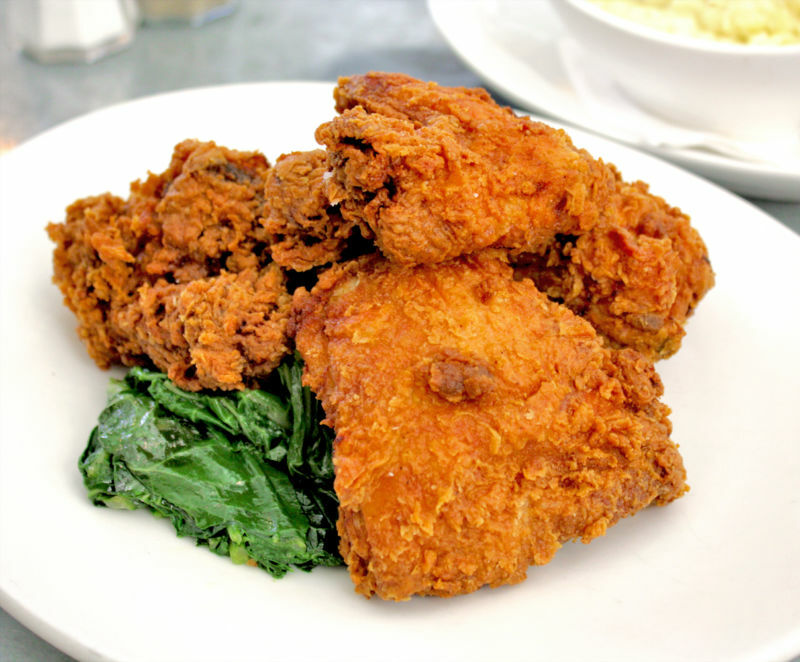 How would one make layers of flavor in fried chicken? I pondered as I took each bite. There was no sauce served with it, but there was something there all the same. As I thought it over, not knowing if I was right or wrong, I came up with what I would do to create this effect in my kitchen. I would make a mix of buffalo sauce with butter and dredge the chicken; before dredging it again in the traditional southern-style buttermilk flour spices mixture. Voila! It would be fun to know if I am right! At the meal I ate a thigh and wing. I loved how the coating was done. However, I wasn’t enamored by the greens or the skinniness of the chicken; there was hardly any meat on it. I buy free range organic so I know that being free range and organic doesn’t equal skinny chicken. The potatoes were good; just what you wanted with a meal like this, but nothing special to make me sing its praises. When I returned home, having realized that I actually hadn’t had enough to eat (due to the skinny chicken) I pulled out my doggie bag (we have no dog) and tucked in to my chicken breast. Alas, the breast was OVERCOOKED. Come on guys! I’m gonna shame you right here. If Popeye’s can cook chicken correctly every time, surely you can. I’m sure their fry cooks get paid less than your chefs do! Having poked fun at the Boonfly Café for this infraction, I want to say again that I am a big fan of their food. I have ordered their salmon and it was cooked to perfection. The Brit and I have also had really innovative dishes like coffee rubbed steak, beautiful pork chops, and other delicious items on the menu. Trust my lousy food luck to pick the signature dish and for it to be messed up. The Brit Comments: In general, the food, wine, and cocktails are excellent. The ice-cream is especially good. We plan to revisit and write a proper review.